Pirate’s Quest is housed in the old Newquay Theatre, a building of historic interest. We aim to meet the needs of all our guests but there are some features both internal and external which make the property unsuitable for most types of wheelchair access. Please phone to discuss as we will always try to find an alternative way for you to meet our Pirates even if you can’t access the experience. 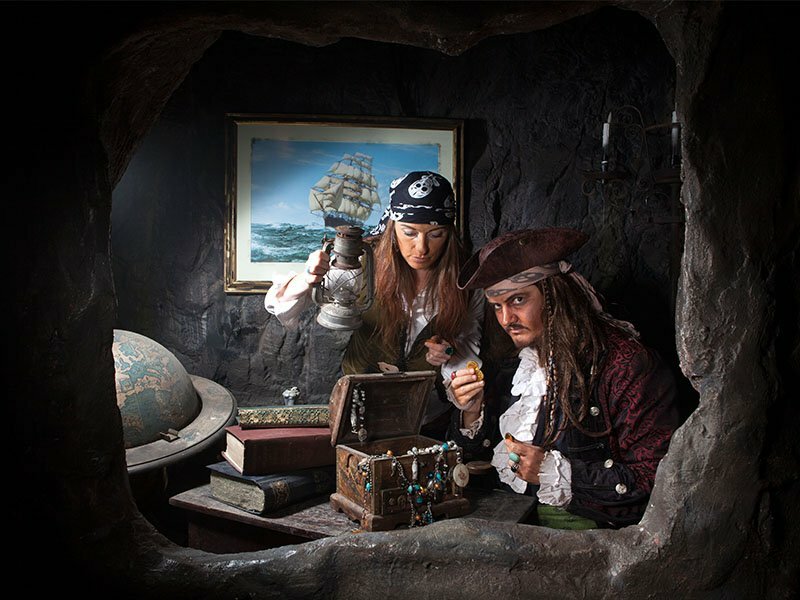 Please click here to download Captain Jack’s Guide to Access at Pirate’s Quest. From St. Michael’s Road there is one step then a flat area, followed by a 90 degree turn and 12 steps leading to a flat area at the front of the building. Access can also be gained from St. Michael’s Road via the short but steep driveway on the right hand side of the building leading to two steps up onto the flat area at the front of the building. Three further steps then lead up to the entrance door of the Ticket Office and ‘Treasure Shoppe‘. Inside, the building is dressed as caves and coves and guests follow a path which twists and turns through the tunnels. The path is mostly level timber floor with some gentle ramped areas. From one of the early scenes, ‘Pirate’s Grotto‘, seven steps lead up into ‘Hooligan’s Hideout‘. Further into the attraction, the entrance into and exit from ‘The Locker of Davy Jones – Scare Section‘ also has seven steps. On exiting the building there are 11 steps down from the exit doors to the flat area at the front of the building. Additionally there are two fire exits. One at the entrance to ‘The Locker of Davy Jones – Scare Section‘ which has five steps leading up to a flat area at the rear of the building, and one on the ‘Deck of the Ship‘ which has one step leading down to a gravel path at the side of the building. The gravel path is too narrow for wheelchair access. There are toilets located in a separate corridor near the front of the building, however none are accessible to wheelchairs as the corridor is too narrow. For more information please contact us on 01637 873379.